It was launched under the Mega Food Park Scheme and is promoted by Paithan Mega Food Park Pvt Ltd. The first park was inaugurated in Satara district in March 2018. Third Mega Food Park has been sanctioned by Union Ministry of Food Processing Industries in Maharashtra in Wardha district. It has been set up in 102 acre of land at a cost of Rs 124.52 crore. The facilities at Central Processing Centre (CPC) of this mega food park include dry warehouse of 10,000 metric tonne (MT), cold storage (1,000 MT), pre-cooling facility (10 MT), ripening chambers (400 MT), individual quick freezing (IQF) facility (1.5 metric tonne per hour). It also has a freezer room (1,000 MT), five MTPH juice line (1.5 MTPH each) of aseptic packaging line, steam sterilisation and generation unit of 4 MTPH, food testing labs reefer vans of 30 MT and milk tankers of 50 MT, milk processing facility of 1,00,000 litre per day (LPD) with bulk milk chilling of 20,000 litre and other food processing facilities. Significance of this Mega Food Park? The modern infrastructure for food processing created at the Mega Food Park will benefit the farmers, growers, processors and consumers of Maharashtra and adjoining areas immensely and prove to be big boost to growth of food processing sector in Maharashtra. This mega food park will benefit the people of Aurangabad district as well as nearby districts of Nashik, Dhule, Jalgaon, Buldhana, Jalna, Bid and Ahmednagar. It will provide direct and indirect employment to 5,000 persons and benefit about 25,000 farmers in CPC catchment areas. It is implemented by Ministry of Food Processing Industries to give a major fillip to food processing sector by adding value and reducing food wastage at each stage of supply chain with particular focus on perishables. It aims to create modern infrastructure facilities for food processing along with value chain from farm to market with strong forward and backward linkages through cluster based approach. Projects under this scheme are merged under the comphrehensive flagship scheme of 'Pradhan Mantri Kisan SAMPADA Yojana'. Under this scheme, common facilities and enabling infrastructure is created at Central Processing Centre (CPCs) and facilities for primary processing and storage is created near farm in the form of PPCs and CCs. For this scheme, Government provides financial assistance upto Rs. 50.00 Crore per Mega Food Park project. Q. 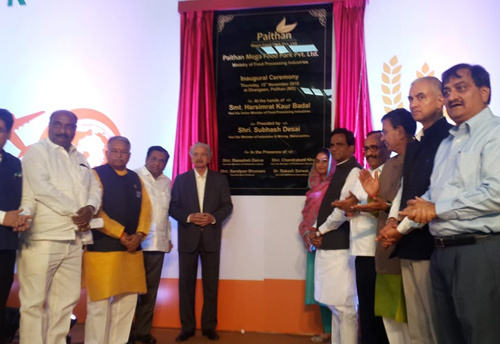 Who inaugurated 2nd Mega Food Park in Maharashtra, in Wahegaon and Dhangaon village in Paithan taluka of Aurangabad district?